With a record-extending 10th European Cup secured, the removal of that burdensome weight helped propel the buoyant celebrations of everyone associated with the tournament's most successful ever team. And no wonder Ramos was relishing the occasion. Controversial and divisive to some but worshipped by Real's fanatical fans, the Spain international defender has scored six goals in seven games – none more important than the one which saved his side when they were seconds from defeat in Saturday's European Champions League final. Atletico Madrid midfielder Gabi, later, admitted it was the moment that broke their will. One-all eventually became 4-1; a flattering scoreline for Real who scored three extra-time goals. The last of those was a penalty kick by world footballer of the year Cristiano Ronaldo; a dream finish for the Portuguese peacock in his homeland. He whipped off his shirt for a chiselled pose, echoing the financial muscle that has been flexed by Real's owners since their last Champions League triumph in 2002. A billion dollars for the European Cup? Most of us would baulk at the price but it's been estimated they've spent at least that much on players over the last 12 years but, for me, coach Carlo Ancelotti's appointment has been far more pivotal than any of those star signings. A decade ago, during his first spell as Real president, Florentino Perez was famous for his "galacticos" policy. Purchase the absolute best players on the planet and trophies will follow. It was only a partial success. Since his return to the club, Perez has still spent big but there's been more consideration for the coach needed to organize and harness a star-studded squad. That's why I was surprised when Jose Mourinho failed. 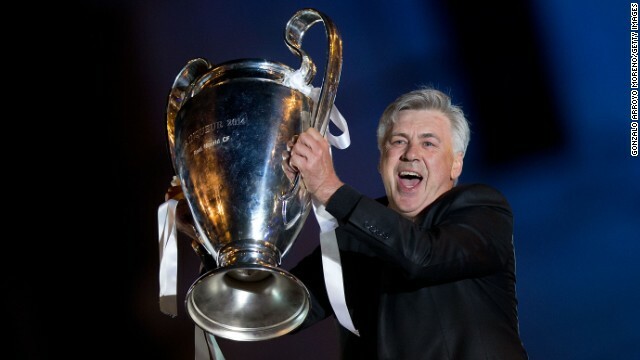 Now La Decima is in the bag it's easier to see why Ancelotti has done better than his predecessor. We had heard so much about how Atletico Madrid's players would run through walls for their coach Diego Simeone that we had overlooked how Ancelotti's arm-round-the-shoulders style could also motivated a team. While journalists applauded Simeone into the post-match news conference, it was Ancelotti who was given a celebratory soaking by his players as he faced the press. The water messed up the microphones but the public display of affection was telling. The Italian may have looked quiet next to his Argentinian rival in the opposite dugout, and positively mute alongside his own assistant Zinedine Zidane, but Ancelotti's second half tactical changes spoke volumes. The introduction of Marcelo as a second-half substitute, in particular, had a huge impact. No wonder Ancelotti has won championship titles in England, Italy and France. He claimed the Champions League twice as an AC Milan player and twice as the club's coach; victory in Lisbon means he has now matched legendary Liverpool boss Bob Paisley's record of three European Cup titles. At the Stadium of Light, Real had more possession than Atletico. They completed more passes, had almost double the number of shots at goal. And they fouled less. It's hard for neutrals to love the world's richest club but they were the better team in the Champions League final on the pitch and, off it, they earned a landmark 10th European Cup with their hiring of Ancelotti. What I believe Madrid won the trophy due to two major reasons,the first one is that,Madrid have best players in term of quality,capacity,ability and classic compared with Atletico who believes on team work rather than individual abilities,secondly Ancelotti is experienced coach in champions league compared to Semeone even in tactics and skills you can not compare Diego and Carlos,however I congratulate Atletico for showing high quality of team work in all games. Not even a single word concerning Diego's early substitution: nothing to say when a team's best player has to leave his teammates alone ? Congratulations to Senhor Carlo and his winning squad. Well played Real.